The Dark Web’s reputation and heinous stories are well-known. So the first time someone hears about Facebook Dark Posts, they tend to think of something malevolent. It is natural to assume that things on the internet starting with “dark” are offsprings of the Dark Web. Thankfully, this is a common misconception. This is certainly the case with Facebook Dark Posts. They actually are a strategy used by marketers to improve the number and quality of leads. No, Facebook Dark Posts aren’t witchcraft. They’re not edgy teenage posts from kids “not going through a phase, Mom” either. They have absolutely nothing to do with Darth Vader. And despite their – well, dark – name, they’re not malicious at all. The only evil thing about Dark Posts is the wickedly good results you can get. And henceforth, the official name became Unpublished Page Posts. The name change also helped clarify exactly what Dark Posts are. They’re simply unpublished posts for your business page. If you’re thinking, “Why on earth would I use that? There’s no point!” Then you’ve come to the right place. There are actually plenty of benefits to using Dark Posts, and they all have to do with running Facebook Ads. We’ll cover perks, how to create them, as well as how to use them for good here in this article. Have you ever looked up reviews of a product or service before buying it? 84% of people do, so there’s a strong percentage that you’re in that group. Now have you ever seen an ad on Instagram or Facebook and considered looking into the brand because of the sheer amount of feedback? If not, think about two posts – both alike in content. But one post has 3 likes, 1 comment, and 4 shares. Meh. Not a big deal. The second post has 100 likes, 20 mixed comments, and 50 shares. Wow! That company must be doing something right to get all that social attention. Gaston knows all about getting social attention. Chances are, that second company is using a Dark Post. A single ad shared to one audience may not accumulate a ton of social proof on its own. A post that can be interacted with by many audiences will gather a bit of social proof from each audience. A little bit from each audience will add up to a lot of likes, comments, and shares for one post. The other perk to using Dark Posts is that they save you a ton of time. Have you ever dreaded opening Facebook Ads Manager because you don’t want to build a bunch of new ads? Have you ever manually created ad after ad to run against each other – and realized that the day has passed? With Dark Posts, you’ll have an ad already created and ready to go. You’ll just need its Post ID, and voila, it’s a plug and play. Long, long ago, advertisers on Facebook had two options when it came to their social media posts. They could choose to make a social media post, which would be available for anyone and everyone to see. Or they could create posts that were only visible to a select audience and pay to run these ads. This gives you the opportunity to look at the ads that business is running. It also allows you to see the established date of the business and historical changes made to the page. This helps verify the legitimacy of a webpage. 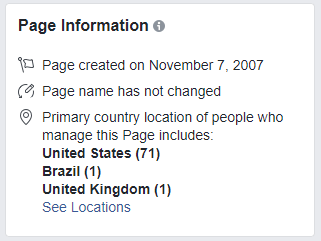 For example, if Facebook’s webpage showed that it was created January 2019, you’d know that you’d have a pretty strange situation on your hands. You may be wondering if having every ad and post available to the public is really such a good thing. After all, now everyone can see everything you’re advertising. Most companies stand behind Facebook’s transparency, especially after certain events of the 2016 election. Some companies did have concerns about their competitors now being able to see what they were doing but admitted that “competitive insights are only one factor of holistic planning”. I’m sure there are a few ways you can go about creating a dark post, but we’ll share the easiest and most relevant to 2019 one that we’ve found. Without further ado, let’s crack into it. To create a dark post, first pop open the Facebook Ads Manager. Then click on the Ads Manager Menu in the upper left-hand corner. Then under the Create & Manage Column, find Page Posts and click on that. Here you can view all posts made by your page. You can sort it by Scheduled, Published, or Ads Posts. For this article, we’ll be staying in the Ads Posts section. Link – A link is just promoting a webpage, some ad text, and a call to action button, if you’d like. Carousel – A carousel gives you the option of uploading a series of images or a video/slideshow that can each have their own unique headlines, descriptions, and URLs. Photo – A photo is your standard image and ad text ad. Video – A video is the same as a photo post, but just with a video instead.  Status – A status is unique in the fact that it doesn’t require a webpage to be promoted, but just requires post text. No matter what post type you choose, you’ll have the option of answering how you want to use this post. You can choose to use the post for an ad only, meaning it won’t show up on your page. 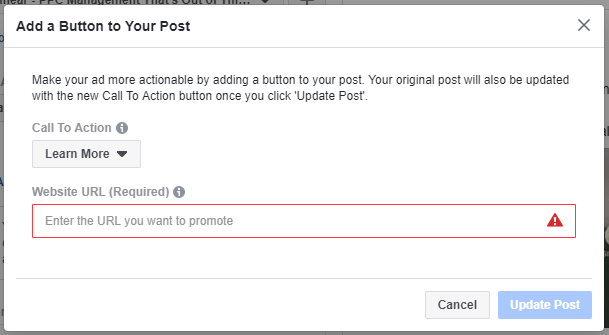 Or you can use the post for an ad with the option of publishing it to your page later. But because we’re just focusing on building an ad with this example, let’s keep the default selected. After you upload your media, write some post text, and create the post, you’ll see your post immediately appear in the selection. Pretty great, huh? You can create as many as you like here, and they’ll be saved as you go along. Just remember to leave “only use this post for an ad” selected, and your page won’t explode with posts. Here’s the part that we’ve all been waiting for. You’re saying, “Well, it’s great that I can create these unpublished posts, but what do I do with them?” Grab a snack and get ready to learn something. We’ll cover the two main ways to create Facebook Ads with Dark Posts: the Ads Posts way and the Ads Manager way. In the Ads Posts section, you can create more than just the dark posts themselves. Here you can either create your new campaign, use an existing one, and select any of the options available to you in Quick Creation. The main difference is that you’ll already have your ad created for you. Once you select Save to Draft, Facebook will bring you over to your Ads Manager. 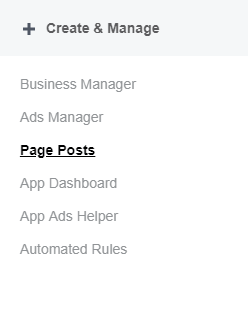 Here you can make your standard edits for ads in Facebook Ads Manager. You can double check your Campaign, Ad Set, and Ad before you choose to publish it. Facebook Ads Manager is your go-to for all traditional ads. But did you know that you can also create Facebook Dark Posts from your Ads Manager? In this example, I’ll run you through quickly creating a new campaign, ad set, and finally the dark post ad. In your Ads Manager, go ahead and click on the create button. You can do this from the Campaigns, Ad Sets, or Ads tab. From there, you can enter in all your information for your campaign and ad set. 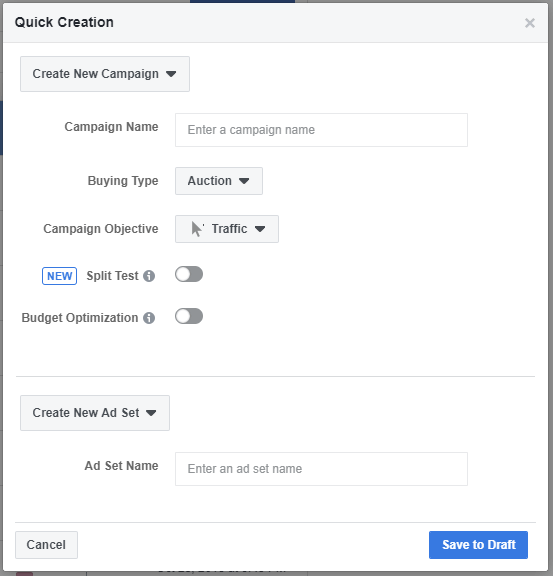 For a comprehensive walk-through of Facebook Ads creation, check out the creation section of our Facebook Ads Manager article. When you get to the Ad Section, you’ll want to pay attention to where the traditional ad process differs from the Facebook Dark Post type. This starts at the top – you’ll switch over to Use Existing Post instead of creating a new ad. From there, you’d think that you’ll click the drop-down for Select a post, but if you do that, uh oh. You’ll only see published posts from the history of the account. Instead, you’ll want to enter that Post ID in the little text box. And boom! Your post shows up as a bona fide ad. One thing not blatantly mentioned on Facebook, but depending on the post type and/or campaign objective you chose, you might get an error. However, this is easily remedied. Although it might not be obvious, go ahead and click on that Add a Button option under Call to Action (Recommended). You’ll have the option of adding a Call to Action and entering your website. You’ll then see the ad update reflected in the preview. After you double check it, you’ll be ready to publish it. Let’s say you didn’t ctrl+c & ctrl+v your Post ID when you had the chance. 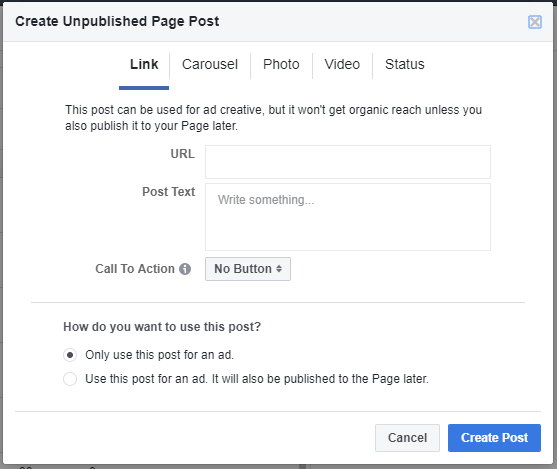 Let’s also say you’re choosing to create your new ads in Facebook Ads Manager. In short, you might not know where to find the post ID. There are two easy ways to find this information: one for while you’re creating your first ad and one for when you already have an ad. First, and perhaps the easiest way to find your Post ID for creating a new ad would be to hop back over to Page Posts. Remember, it’s under the Menu and in the Create & Manage column. From there, you can see Post IDs to your heart’s desire. And just by clicking on the post, you can also have an at-a-glance overview of how your post is doing. Note the Post ID is right at the top of the Post Details. After you collect that Post ID, hop back over to your Ads Manager to finish completing your ad. If you have an existing ad that’s already using your Dark Post, you can easily find that Dark Post ID. (Pro Tip: The most efficient way to create multiple Dark Posts might be to duplicate your Ads, Ad Sets, or Campaigns and change settings as needed. But if you’re just looking to find the Post ID from the existing post, open your existing post’s editing options. In the upper right-hand corner, you’ll find a little arrow in a box button. Clicking on that box will give you a few cool options. The one you’ll want to use to find the Post ID will be See Post > Facebook Post with Comments. 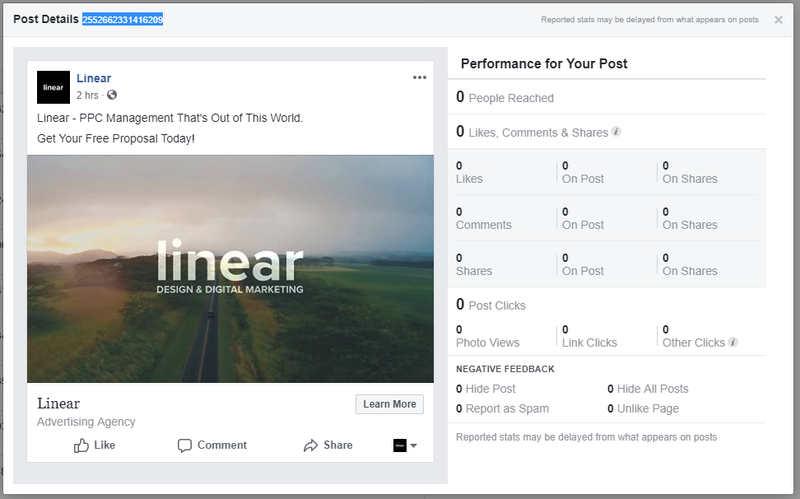 This will pop open a whole new tab for you to see your Facebook Post as it appears (or would appear if it was published). This is a cool way to check out how it’s doing as far as social statistics, but it’s also a quick way to find the Post ID. Take a look at the URL. The last section of the URL will be your Post ID. You can copy & paste that bad boy for your future use. One important thing to note about Facebook Dark Posts is that you should use a different way of tracking them. If you generally code your utm parameters into your website link, you’ll want to make changes to the tracking. If you’re using the same post across multiple campaigns, the original utm for the Dark Post will follow the post to your new campaign. This will show all of your conversions as coming from one campaign. That’s right, even if your dark post is in multiple campaigns, you’ll only see results coming from one. And that might not be accurate, right? Facebook has more options to offer when it comes to tracking, however. Take a moment to see them here if you’re used to using hard-coding your utm into your link. There’s never anything that you don’t test! If you want to improve your results, then you’ll need to learn how to optimize ads – even Facebook Dark Posts. Thankfully, optimizing Facebook Dark Posts is about the same as testing other ads. You’ll want to consider running a few tests to continually improve your ads. Sometimes optimizing your ads for conversions just won’t align to your goal. Thankfully, Facebook offers the option of optimizing your ad delivery. If your Dark Post is promoting a blog or other content, however, you’ll want to optimize for clicks or landing page views. Try testing the metrics on your Dark Post to see which one is getting you the best results. Single Variation Testing – or A/B Testing – is the concept of testing one element of your ad at a time. In testing one variable at a time, you’ll clearly see what’s working and what isn’t in your ad. You can test the image, the ad copy, or the headline, but remember to only change one thing at a time. You’ll also want to make sure the results you’re seeing are significant before you make changes. We recommend using an A/B Testing Calculator for the most definite results. Almost the entire point of running Dark Posts is to gather social proof and improve your leads. One way to continually improve the stats for both of these goals is to test your audience. By presenting the ad to more groups of people, you’ll gather social proof faster. Remember, every like you get builds up on one post. You’ll also be able to test which audience reacts to your ad better. This is especially helpful if you’re trying out new Saved & LAL audiences. Or if you’re trying to pin down that certain demographic’s performance. 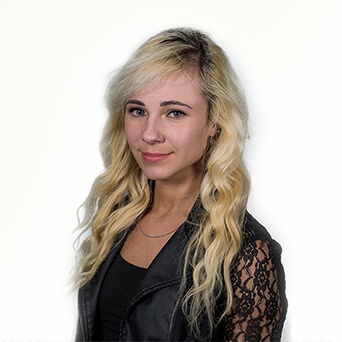 Even trying to test different types of remarketing audiences can be useful here too. The great thing about Dark Posts is that you won’t spam your audiences. 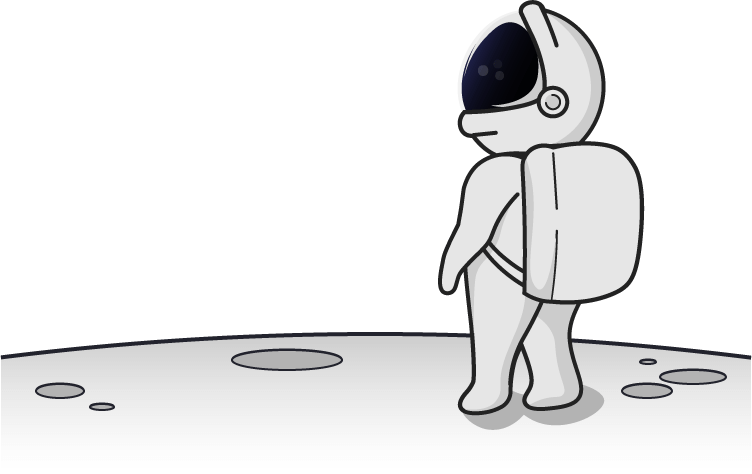 Let’s say you’re launching the release of multiple products and want to see who will react to what product. 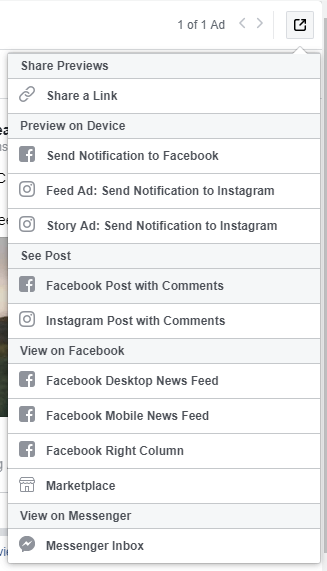 Some advertisers will make multiple posts for each product and publish them all on their business page. Spamming your audience’s feed will make them think of you like this. Rookie mistake. Now you’ve just spammed your hard-earned audience with a ton of ads. They’ll be running for the hills. But considering Dark Posts aren’t published posts, your general audience won’t see a million ads a million times. This gives you the freedom to test anything you’d generally test in your ads without blowing up anyone’s feed. Snow White should’ve asked about the downsides too. 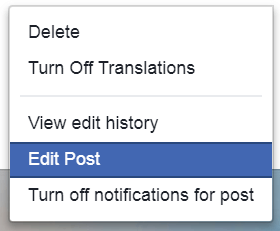 The main issue people run into with using Facebook Dark Posts is that you can’t edit them. That’s right, once you’ve created your ad post and made an ad out of it, there’s no going back. If you haven’t tied your ad post with an ad, you can still edit it from the Post Details window. However, if you have already boosted your post with an ad, your options will be slightly different. So in short, if you catch a spelling error after you’ve boosted the post, you’ll need to start from scratch. That can be frustrating and negate the entire purpose of using a dark post – keeping social proof. Facebook Dark Posts are excellent to use Dark Posting can help save you a ton of time. Wouldn’t you rather copy & paste a Post ID instead of creating a whole bunch of new ads? If you’re the type to post on your business page, Facebook Dark Posts can help you not spam your followers. Lastly, the sheer amount of easy testing you can get away with can feel like you’ve been given infinite power. Releasing an evil cackle is fine, just don’t get carried away and ask to become a genie or anything. So tell us, have you used Facebook Dark Posts? What kind of results did you get? Was there anything difficult to understand or implement? Let us know in the comments!